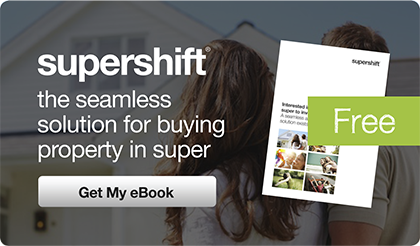 Simply enter your name and email address below to download your FREE SuperShift eBook. Don’t worry, your information will not be provided to any third parties. SuperShift iQ may email you from time to time with information on special offers and updates, you will always reserve the right to unsubscribe from our email list at any time. A download link to the eBook file will appear once you press “Submit”. An SMSF is a tax structure you control in preparation for retirement. It provides you with greater control, flexibility and choice - you can invest in any asset, in any currency, anywhere in the world. The information provided on this website (including the video on this page) is as an information service only and, therefore, does not constitute financial product advice and should not be relied upon as financial product advice. None of the information provided takes into account your personal objectives, financial situation or needs. You must determine whether the information is appropriate in terms of your particular circumstances. For financial product advice that takes account of your particular objectives, financial situation or needs, you should consider seeking financial advice from an Australian Financial Services licensee before making a financial decision.